OTAMA, Fukushima － The Otama village government and the Peruvian village of Machu Picchu have agreed to undertake a variety of exchange activities, following up on last October's agreement that made them sister villages. 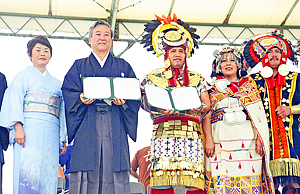 A delegation from Machu Picchu visited Otama for a signing ceremony on Aug. 7, held as part of the village's summer festival. The village in Peru is home to the Historic Sanctuary of Machu Picchu, a World Heritage site known as "the city in the clouds." Otama and Machu Picchu formalized their friendship accord at the site in Peru on Oct. 26 last year. It was the first time for both sides to conclude such an accord with another municipality. The villages are connected through Yokichi Nouchi (1895-1969), an Otama native who became the first mayor of Machu Picchu. Nouchi emigrated to Peru and worked to develop Machu Picchu's tourism. Beloved by local residents, he eventually became a leader in the village. Machu Picchu has had numerous requests to form friendship pacts from municipalities around the world, but the village government decided to extend a hand to Otama because of Nouchi's contributions. For the signing ceremony, members of Machu Picchu's official delegation, including Mayor David Gayoso Garcia, 39, wore formal outfits from the time of the Inca Empire. Otama Mayor Toshikazu Oshiyama, village assembly speaker Yoshio Endo and other officials wore formal haori coats and hakama trousers for the event. At the signing ceremony, officials from both villages wore the same attire as at the friendship accord ceremony at Machu Picchu last year, demonstrating their mutual affection for the Otama residents who attended the ceremony. "We welcome your visit to the prefecture from our hearts. I hope the exchanges between our villages will continue for a long time," Oshiyama said. In his remarks, Gayoso said: "I would like to pass on the friendship between our villages to the next generation by maintaining it for a long time. Though in distance we are far away on the other side of the world, in feeling we are close by." The agreement confirms that the two villages will engage in exchanges over education, agriculture, tourism and the economy for the social and economic benefit of both sides. For education, the agreement describes student cultural exchanges through popular arts such as painting and handicrafts. Agricultural projects could include exchanging information on farm production and sharing technology. For tourism, they plan to solicit donations using the friendship accord and both villages' names, and to promote exchanges of their tourist products.